The highlight of your day will be a visit to Butrint – an UNESCO World Heritage site. Over the centuries, the ancient town had disappeared under layers of silt and vegetation. In recent years, however, archaeologists have uncovered some of the finest working town remains in the Mediterranean. At the edge of the lake is the ancient city of Vouthrota. The Venetian Tower near the entrance, the ancient theatre, the Temple of Asclepius, the ancient gymnasium, the Roman Baths, the Roman Baptistery with its priceless mosaic floor, the Lion gate and the enormous Cyclopean walls will transport you back in time from 2,500 years till the 3rd century A.D. At the top of the hill stands the Venetian Castle, offering breath-taking, panoramic views of the ancient city, the lake and the vast plains below. Lunch is served upon your return to Saranda. 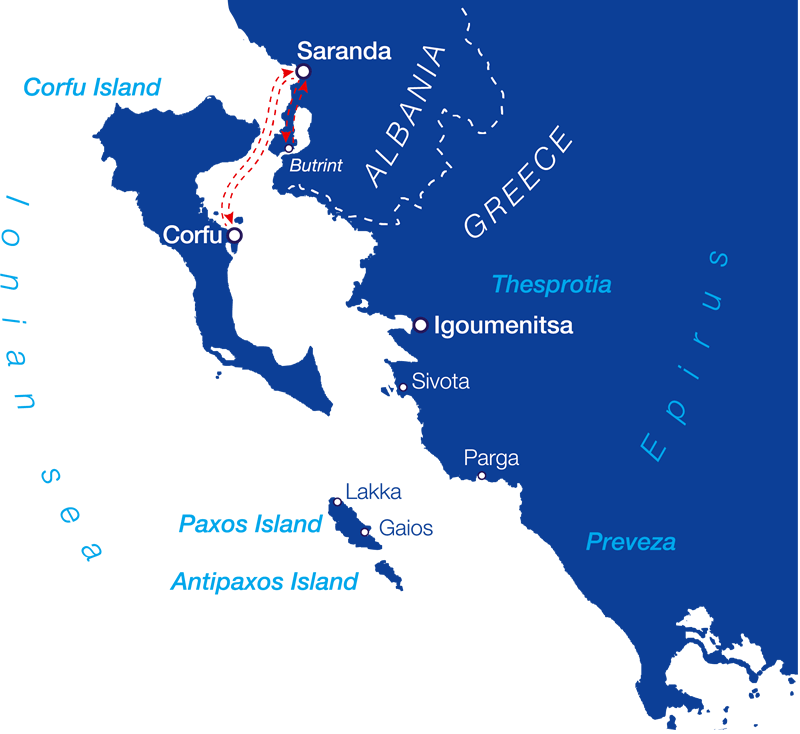 In the afternoon, there will be a walking tour of Saranda, after which we finally depart this land that time forgot. 11:50 Arrival at the archaeological area of Butrint. Tour lasts between 90-110 minutes depending on age. The tour for elderly or disabled guests will include 70% of the archaeological area (with a separate guide when necessary). There is a small bar/ kiosk at the entrance to the site. Public bathroom facilities are available at the end of the tour in the Venetian Castle on the Acropolis hill. 14:10 Arrival at the same restaurant in Saranda for a buffet-style lunch.